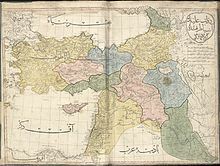 The Karamanids or Karamanid dynasty, also known as the Principality of Karaman and Beylik of Karaman, was one of the Islamic Anatolian beyliks, centered in south-central Anatolia around the present-day Karaman Province. From the 13th century until its fall in 1487, the Karamanid dynasty was one of the most powerful Turkish beyliks in Anatolia. The Eyalet of Silistra or Silistria, later known as Özü Eyalet meaning Province of Ochakiv was an eyalet of the Ottoman Empire along the Black Sea littoral and south bank of the Danube River in southeastern Europe. The fortress of Akkerman was under the eyalet's jurisdiction. Its reported area in the 19th century was 27,469 square miles (71,140 km2). Karaman Eyalet was one of the subdivisions of the Ottoman Empire. Its reported area in the 19th century was 30,463 square miles (78,900 km2). Baghdad Eyalet was an Iraqi eyalet of the Ottoman Empire centered on Baghdad. Its reported area in the 19th century was 62,208 square miles (161,120 km2). The Ioannina Eyalet was an administrative territorial entity of the Ottoman Empire located in the territory of present-day southern Albania, central and northern Greece. It was formed in 1670 and its administrative centre was Ioannina. In period 1788—1822 Ali Pasha, the sanjakbey of Trikala, seized control over Ioannina and after enlisting most of the local brigands under his own banner took advantage of a weak Ottoman government to gain control over the Ioannina Eyalet and most of Albania and continental Greece, transforming it into the semi-autonomous Pashalik of Yanina. After he was killed in 1822 the Ottoman Empire reestablished the Ioannina Eyalet which existed until establishment of the Janina Vilayet in 1867. The Eyalet of Bosnia or Bosnia Beylerbeylik was an eyalet of the Ottoman Empire, mostly based on the territory of the present-day state of Bosnia and Herzegovina. Prior to the Great Turkish War, it had also included most of Slavonia, Lika, and Dalmatia in present-day Croatia. Its reported area in the 19th century was 20,281 square miles (52,530 km2). The Erzurum Eyalet was an eyalet of the Ottoman Empire. It was established after the conquest of Western Armenia by the Ottoman Empire. Its reported area in the 19th century was 11,463 square miles (29,690 km2). 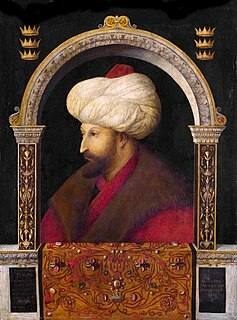 Dulkadir Eyalet or Marash Eyalet was an eyalet of the Ottoman Empire. Its reported area in the 19th century was 77,352 square miles (200,340 km2). The Eyalet of Rumeli or Rumelia, also known as the Beylerbeylik of Rumeli, was a first-level province of the Ottoman Empire encompassing most of the Balkans ("Rumelia"). For most of its history it was also the largest and most important province of the Empire, containing key cities such as Edirne, Yanina (Ioannina), Sofia, Manastır/Monastir (Bitola), Üsküp (Skopje), and the major seaport of Selanik/Salonica (Thessaloniki). Mosul Eyalet was an eyalet of the Ottoman Empire. Its reported area in the 19th century was 7,832 square miles (20,280 km2). The eyalet was largely inhabited by Kurds. Ottoman wars in Asia refers to the wars involving the Ottoman Empire in Asia. Ottoman Empire was founded at the beginning of the 14th century. Its original settlement was in the north west Anatolia where it was a small beylik (principality). Its main rival was Byzantine Empire. In 1350s Ottomans were able to cross the Dardanelles strait and eventually they conquered whole south east Europe. Although they mainly concentrated on Europe, they also fought in Asia.